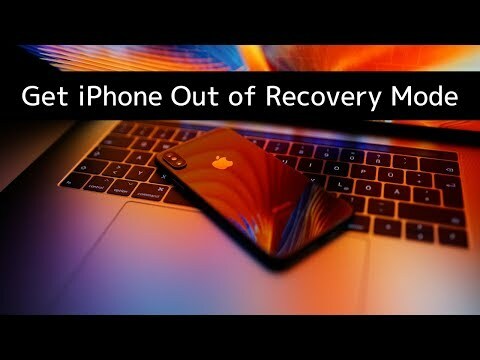 If you want to reinstall or restore iOS on your iPhone or iPad and it doesn't work in Recovery mode, you may need to put it into DFU mode. Turn the device off: to do so press and hold the Power button on the right side (iPhone 6 or later) or top (all other iPhones, iPods, and iPads) for 3 seconds and swipe the slide to power off to the right. If your device is in Recovery mode, skip this step. Press and hold down the Power button for 3 seconds. You may need to skip this step and directly apply step 4 when your device is in Normal mode (instead of Recovery mode). Hold both the Home and Power buttons for 10 seconds, then release the Power button while still holding down the Home button. For iPhone 7/7 Plus or higher: Hold down the Power + Volume Down buttons instead of Power + Home buttons. If you see the Apple logo, you've held them too long and will need to start again this procedure. After about 15 seconds, the device's screen should be black and iTunes may launch and show you an alert saying "you must restore your device before it can be used". If you see this message, click OK and quit iTunes. Now iMazing should show your device in DFU mode. You can click Reinstall iOS and iMazing will install iOS and reboot your device. If you want to exit DFU mode, press the Home and Power buttons and hold them until the Apple logo displays on your device.  Tip: It's not easy to enter in DFU mode and you may need to retry multiple times. If you see anything displayed on your device such as a logo, your device might be in Recovery or Normal mode, but not in DFU mode. If reinstalling iOS in Recovery mode works, that's good. Otherwise try again to enter it in DFU mode.